Description: Strasburg 90 & PRR 1223 prepare for the day's runs. Description: Now known by its original J-Tower moniker. Thanks to the Lancaster Chapter NRHS for saving this Victorian Era gem! Description: The Lancaster Chapter NRHS hosted the convention, which was based in Lancaster and Strasburg. 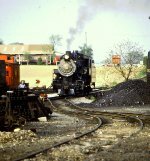 Description: Strasburg 89 & 90 meet at Groffs Grove (Carpenters). Kodachrome by C. Hash. Description: Some days you just get lucky. The weather is perfect, the light is perfect, your camera performs flawlessly, you're in all the right places at the right times, and you have a phenomenal subject. Actually, Strasburg #90, while beautiful, isn't the most spectacular steam locomotive you could ever find. It's just a Baldwin Standard Decapod 2-10-0 from the 1920s that was designed for hauling freight on branchlines, but it's big and bulky enough to give the impression of massive, overwhelming force. On this particular day, I wasn't in Strasburg to take photographs, but to do documentary research, but I got very lucky coming out of the Pennsylvania State Railroad Museum in that #90 was there exactly when I was, and it was a blazing hot summer day. You can see the brightness of the sun in the pictures, and although the originals are fine, the scans look more bleached. It's the only shame in displaying them here, as my old Omniscan came nowhere close to doing the photos justice. Description: Railroad photographers often like photographing the valve gear, in this case Walschaerts, if I'm not mistaken. Description: This is the turbogenerator, as #90 is new enough to have an electrical system, at least for lighting, anyway. Description: There's the Baldwin builder plate, although in general the photo is interesting, I think. Description: #90 is also new enough to have Westinghouse automatic airbrakes, with the compressor (in the center of the picture) running on steam. 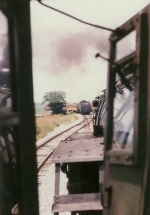 Airbrakes became standard on freight trains in the early 1900s, although there had been pressure, no pun intended, to introduce them far sooner. By the 1920s they were old hat in the United States, even if they weren't universally accepted elsewhere.